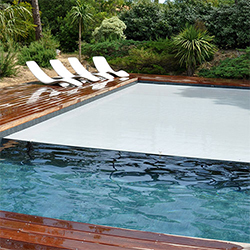 Golden Coast is the exclusive distributor of DEL pool cover products to the UK wet leisure industry. DEL has been making pool covers for 35 years. Suitable for either new or existing pools, every one of their range of covers is manufactured to the highest standard and is the result of their long commitment to design, research and development. 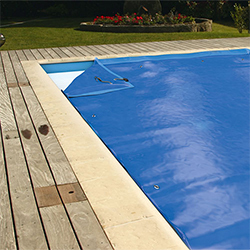 Golden Coast has been exclusive distributor of DEL pool cover products to the UK since 2004. DEL manufacture an impressive choice of slatted type pool covers such as the RollEnergy, RollFit and RollEasy to suit most requirements together with safety cover systems for in-ground and above-ground pools. DEL replacement slats can be specified for most existing cover systems. Cut to exact dimensions, including roman ends or steps, DEL slats are available in 4 colours of opaque PVC or crystal polycarbonate options, for solar gain, in 5 colours. DEL PVC slats all carry a 3-year guarantee. They have excellent buoyancy and are resistant to fading and staining. Ultima is a new automatic safety cover from DEL that offers a complete, all-season solution for covering pools. 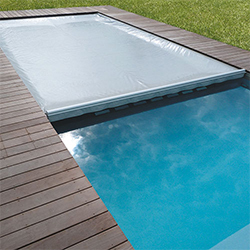 It isolates water from dust and debris, insects and other contaminants while making the pool safer for children. Ultima can be specified for a new build or retrofitted to an existing pool.